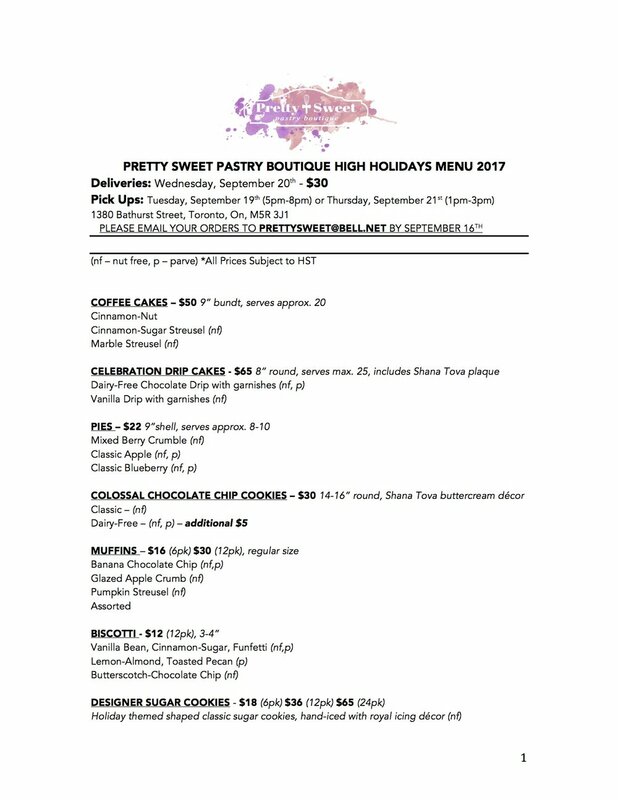 We're so excited to share this year's High Holiday menu! Mix up your holiday dinners with some of our new (and delicious) products! The Gourmet Cereal Bars (specifically the Golden Graham S'mores Bars) are insanely addictive; the Muffins (the Glazed Apple Crumb) for a sweet new year and the ALL of the Coffee Cakes, are what we're currently drooling over. Can it be the holidays already???? We've also dedicated a dairy section of delicious quiches and cheesecakes ideal for breaking the fast! All of the quiche flavours are incredible, and can be enjoyed hot or cold. Both the quiches and cheesecakes freeze very well (whether they're leftovers, or extras to be saved for another time). Before serving, transfer the frozen product to the fridge. If you're heating your quiche, set your oven to 400 degrees and warm it up for approximately 7-10 minutes.